One of the methods of pain relief we offer to back pain sufferers in St. Peters is spinal decompression. This non-invasive back treatment has been available in chiropractic offices since 1996. In the last 20 years, it’s been shown to be safe, effective, and provide pain relief to those who are suffering from certain back and neck pain-causing conditions. 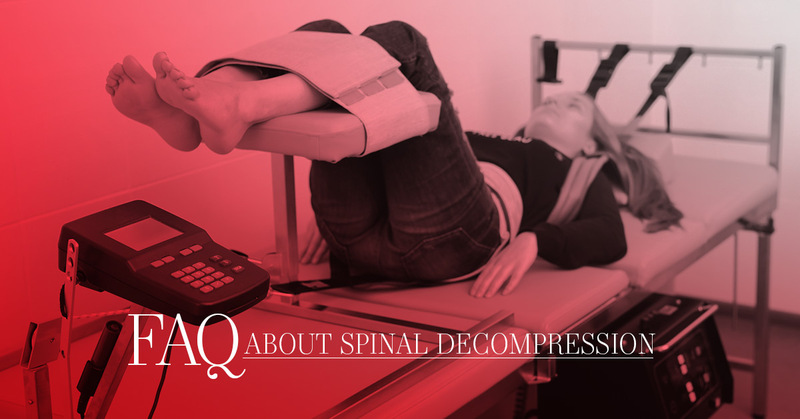 A lot of patients have questions about spinal decompression when they first hear about it and want to know more about the treatment and whether or not it’s going to be right for them. We’ve put together this Frequenly Asked Questions (FAQ) guide to spinal decompression to help answer your questions and get you the information you need about this procedure. Spinal decompression is a non-invasive method of gently stretching out the spine. A specially-built table work to stretch the spine, relieving it of the natural compression that happens over time and returning it to it’s natural length. Over the years, your spine can become more compressed thanks to gravity, weight,, activities, and even injuries. This compression can cause the elements of the spine to become misaligned or to pop out of place. Decompressing the spine can relieve the pressue and allow different elements like discs to move back into the correct position. It can provide an incredible amount of pain relief and help patients avoid surgery. Many of our patients find the treatment very relaxing! Using state of the art equipment, patients simply lie down on a table while our decompression machine gets to work. Our team will ensure that you are kept in the correct position to maximize the decompression. Some patients the the treatment so relaxing that they fall asleep during the treatment and wake up feeling like they’ve had a wonderful stretch of their back and neck! We carefully calibrate the machine to ensure you are getting the right treatment for your condition without leaving you feeling sore. Our team will continue to check on you throughout the treatment to ensure you are comfortable (and if you do fall asleep, we’ll wake you up when it’s done!). The entire process takes less than an hour, and you’ll need to come for multiple treatments. The number of times that you are treated will depend on the severity of your condition; your chiropractic team will be able to give you a better estimate on the number of treatment after your evaluation. What are some of the potential benefits of spinal decompression? You may be able to avoid the cost and pain of surgery. It can stop your back and neck conditions from getting worse. You don’t have to undergo anesthsia. There is no lengthy recovery time. Many people find the treatment to be relaxing! and more. Your treatment team at Cardinal Chiropractic & Physical Medicine will help determine if your particular condition can be effective treated with spinal decompression therapy. How long to the benefits last? It depends! Some patients find relief from their back and neck pain for years. Some people find they need to have a spinal decompression tune-up every few months or every year just to ensure they continue to get the benefits. How long those benefits last are going to depend on the severity of your condition and your lifestyle. The good news is that many patients experience pain relief after their first session! Can I avoid surgery with it? It’s possible. Many people are told that the only treatment option for their back pain is surgery. Unfortunately, there are a lot of problems with back surgery. It’s prohibitively expensive, it requires an incredible amount of recovery time, and it doesn’t always work. We encourage many patients to explore non-invasive options like spinal decompression so they don’t have to go under the knife and deal with the pain of a surgical procedure. It’s certainly an option worth exploring with the team at Cardinal Chiropractic & Physical Medicine. We’d love to see you and find out! The only way to determine whether or not you are a good candidate for spinal decompression is to be examined by our chiropractic team. They will perform a thorough evaluation in order to determine the root cause of your pain and whether or not you may be able to find pain relief through spinal decompression. If they believe that you are a good candidate, they will sign you up for a series of appointment times and get you started on the path to pain relief as soon as possible. Want to See if Spinal Decompression is the Right Pain Relief for You? Cardinal Physica Medicine would love to work with you to see if our spinal decompression therapy is the right choice for you. You can make an appointment with our office to learn more about pain relief options offered here in St. Peters, including spinal decompression. Our experienced, compassionate team will thoroughly evaluate you to determine the root cause of your pain and work with you to develop a care plan that can help you overcome symptoms and regain your freedom of movement. Make an appointment with our team by giving us a call or contact us through our website today.